At the end of the month, we will be shutting down our 15th-floor condo for 9 months before coming back to stay for 3 months in December. We have thought of all the obvious things such as a scrupulous deep clean of everything, switch off the water and electricity unplug all devices and the like. The room has great security and a metal gate on the outside so that it not an issue. But what should we do to preserve the contents in the best condition? My wife has a lot of clothes (!) and she is worried about them smelling. I've nicked a few tips from various sites already but would be interested in what others do and what to expect when we get back. 1. Give away all foodstuffs to the family. 2. Unplug and clean the refrigerator interior. Use a solution of one tablespoon of baking soda in two pints of water,in order to neutralize food soils and prevent odours. Dry thoroughly. Remove and clean the defrost pan at the bottom of your refrigerator. The refrigerator and freezer doors should be left ajar. Make sure that the doors cannot accidentally close. 3. Clean and leave a light coating of wax on surfaces of wood furniture. 4. Thoroughly vacuum upholstered furniture (even crevice areas). If there are spots and stains, remove or clean before closing the home. 5. Remove bedding and bath linens; clean, dry, and store. Vacuum mattress thoroughly and cover it lightly with a sheet. on the floor. Leather shoes, belts, and handbags should be cleaned with leather cleaner. You may even want to spray them with a disinfectant spray. Do not wrap garments or other items tightly in plastic. This may increase the likelihood of mildew. Metal hangers, even when covered with paper, can rust and stain clothing. 7. Leave interior doors open to permit air circulation. One of the most important things is the water in toilet and sink/floor traps. After 9 months the water will evaporate and sewer gases can the enter the condo. I would be paying someone to come and flush toilets/run taps etc, air out for an hour, check for birds nesting on balcony etc. 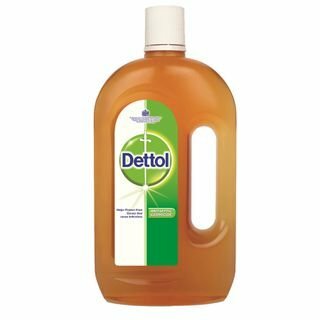 i use Dettol to disinfect my house. just add a small amount to hot water. my maid mops the whole house, bathrooms, kitchens, everything with this stuff. and clean and wipe down the whole place where possible. My wife was saying the same thing - it's quite expensive here though is there a Thai equivalent - we paid 92 baht for 100ml in a chemist. Pay PEA 5,000bht in advance, problem gone. I tried to pay PEA in advance but they would not take the cash. Not really sure why. They said to set up an automatic payment from a Thai bank account. Hi the toilet will probably dry out in anything over 5 months so cling film the top of the toilet bowl to prevent ingress from insects. I also crumble some mothballs into the drains in case the U bends dry up. I also pay the PEA using a standing charge from my bank account. There is a shortage of electric meters and if you do not pay the standing charge the PEA will disconnect you and take your meter which could leave you with a three week wait for reconnects when a meter becomes available. Saranwrap the toilet to prevent evaporation. Fill zip-lock bags with water and place them over the drains in the shower and sinks, and any other drains. Unplug everything from the electrical outlets. Shut off the water mains and the electric at the panel (make sure the meter stops spinning). You really should have someone you trust walk through the place once a week or so to make sure there are no problems like mold growing because of the humidity. Install a couple of WiFi enabled cameras in the main rooms so that’s you can keep an eye on it from overseas. Tell your mia noi she can use the place as long as she flushes the toilet once a month. Many thanks for all the suggestions both practical and humorous - we have family close by but the thought of them lounging in our precious space (which they would I'm sure at length) is at the moment too much to contemplate but I am feeling a bit selfish thinking this way. I may soften towards the end of the month. Seems like the toilet is the main worry then. Thanks Ken we have done that so one less thing to worry about.